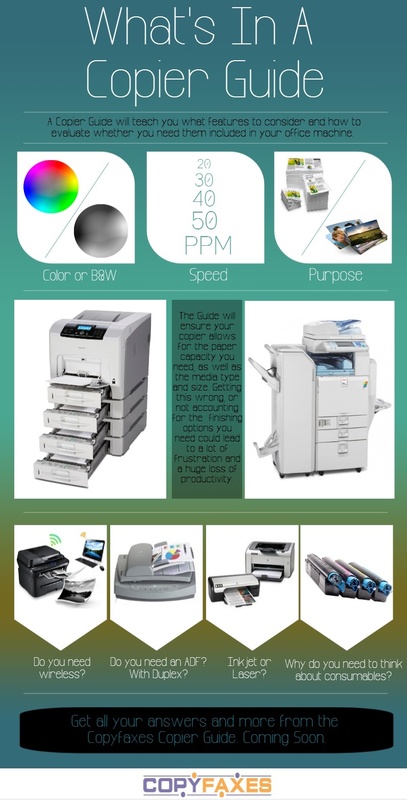 A Copier Guide? What’s that?? By now, you may have come to terms with the fact that you have no clue how to choose the new office machine you so desperately need. You’ve browsed the web, spoken to a few know-it-alls, but to no avail. What on earth is the duty cycle? And how do you know how to work out what volume you need?? You may want to check out our Specs for Dummies to help you out. But if you’re still at a loss, you’re in luck. Your answers are on the way, in the Copier Guide by CopyFaxes, soon to be released. What’s that you want to know..?? Many people would never consider buying refurbished products an option. They just won’t hear of it, and cannot understand why anyone else does! Others, do consider it time and time again, but the idea of it is too daunting. They’re too unsure whether it’s safe and worth it, or if it’s just plain silly. And then there are the third type – those who are happily buying refurbished products, no problem. Have a quick look at this infograph and maybe you will be reformed! 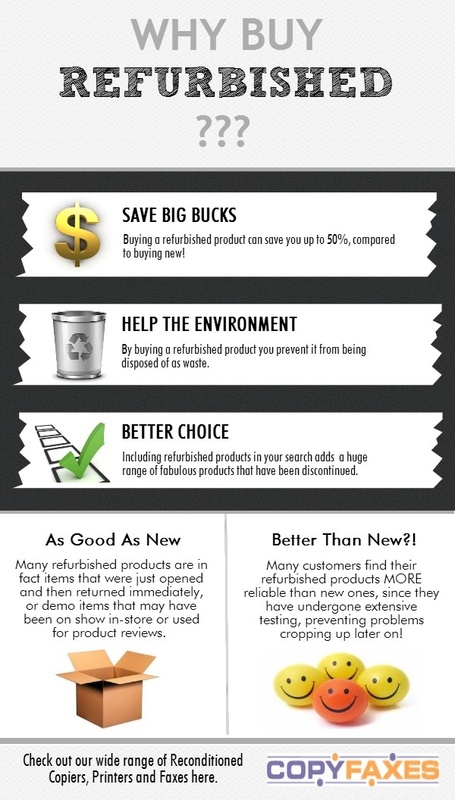 Do you buy Refurbished Products? Share your experiences with us in the comments below. Help! My Laser Toner Cartridge Just Leaked?!?! Toner is an extremely fine powder and in substantial concentration can cause irritation to the respiratory tract which can result in coughing and wheezing. Place a paper mask or scarf over your nose and mouth while dealing with the spill. It is better to vacuum it up and thereby remove all dust particles from the vicinity, as opposed to brushing it which could cause a dust cloud and further spreading of the particles. Any remaining toner powder should be wiped away with a cloth, made damp with a little bit of cold water. Hot water should preferably not be used because it may cause the toner to melt a little and become sticky. Use an abrasive sponge together with cold water to remove toner that has bonded to the skin. Looking after your printer or copier also means caring for the paper you feed into it. Preventing jams and damage to your office machine begins well before you hit the green button; it starts before you even load the paper into the input tray. Follow the tips here for the correct way to purchase, store and load your office paper and save yourself headache and hassle with your new office machine as well. • Using quality paper will also enable a smoother and less problematic printing experience. High quality paper will have some grain to it, so that’s not completely smooth to the touch. This allows the copier or printer to hold onto the paper properly and send it through the machine without “losing its grip”. Generally, the heavier the paper weight, the more grain it will have. Use a minimum of 20lbs paper weight in any copier or inkjet printer and 24lbs. in a laser printer. • Paper should be stored entirely flat and free from any risk of getting wrinkled, warped, or curled. Papers in such conditions are a recipe for causing paper jams in the machine. • Paper straight out the packet might be slightly stuck to one another as a result of the pressure and compression during manufacture when cutting and stacking the sheaf. Make sure the stack of papers you load into the tray are not stuck by loosening the sheets by fanning them or roll the stack gently, diagonally, in opposite directions. • Paper should be placed in the same room as the copy machine at least 24 hours before its use in the machine. This will allow the paper to acclimate to the temperature and humidity of the environment and will help it to perform better. • Pull the tray completely out of the machine when loading the paper and make sure that any sliders are aligned properly to fit the size of the paper you are using. Don’t overload the tray with more papers than the specified capacity. Trying to make a decision when buying a new piece of office equipment can be rather overwhelming. Our aim is to simplify this for you as much as possible. Here at Copier Corner, you will find information and advice on which office machine to buy; be it a printer, fax machine, copier or scanner. You will also find tips on how to best care for your machine, FAQ’s that commonly come up and everything related to office machinery and equipment. We look forward to sharing all this with you! Follow us on Google+ or check out our Pinterest boards for best buys and offers.